Soccer requires quick feet and agility. During games, you not only have to run up and down the expansive field to cover as much ground as possible, but you rely heavily on short, explosive movements and acceleration to beat defenders. Quick feet will also help you dribble the ball, pass and shoot. Performing a few simple drills can improve foot speed and enhance your overall game. Place eight to 10 soccer balls in a straight line, with about 2 feet between the balls. Stand with your right foot on top of the first ball and your left foot to the outside. Jump and switch feet, placing your left foot on the ball and your right foot to the outside. Race to the next ball and repeat, starting with the right foot on the ball. After the last ball, sprint 10 yards. Try to complete the line as fast as possible to build foot quickness. 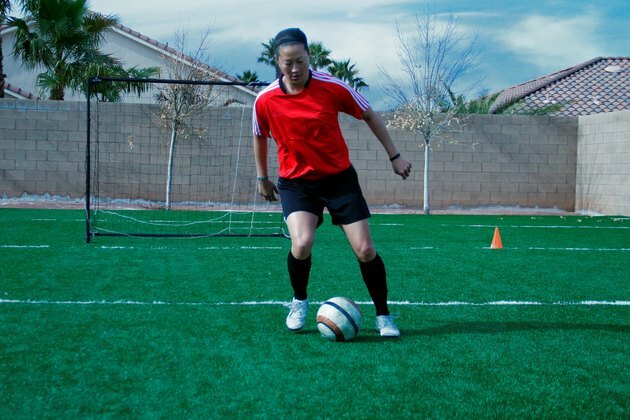 The soccer ball shuttle drill improves foot speed and strengthens endurance. Line up eight soccer balls 10 yards away from the starting line. On the whistle, sprint over and collect a ball, dribbling it back across the starting line. Stop the ball as soon as it crosses the line and then run back to get the next one. Bringing back all eight balls completes the drill. Drive hard throughout the drill for maximum benefit. For this drill, position four cones in a T-shape, the top three cones in a straight line with 5 yards between cones and the starting cone 10 yards straight below the middle cone. Starting at the base cone, sprint the 10 yards to the middle cone and then shuffle sideways to the far left cone. Shuffle all the way across to the far right cone. After shuffling back to the middle cone, spin and sprint back to the starting point. 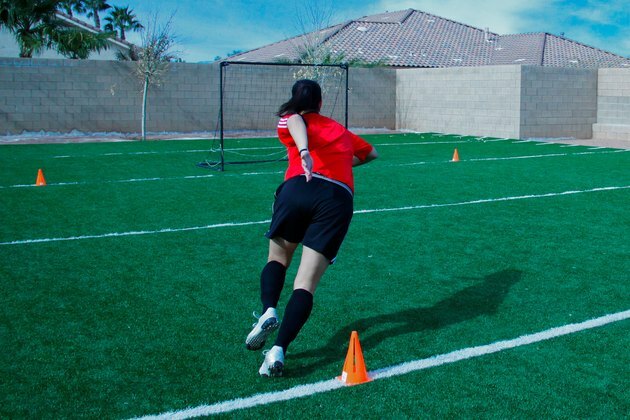 Set the cones in a square pattern with 10 yards between cones. On the whistle, sprint from cone 1 to cone 2. Plant and make a sharp cut so you can then sprint diagonally to cone 3. Sprint to cone 4. Plant, cut and sprint diagonally back to cone 1. Finish the square as fast as possible, building up until you can run it three or more times in a row. You'll need a teammate for this drill. Mark off a large area of the field and have your teammate run wherever he wants. Your job is to stay within 2 yards of him at all times. Your teammate should change direction as much as possible and vary his pace, speeding up and slowing down in an attempt to lose you. After about five minutes, you can change roles, with your teammate now having to follow you.